The past two weeks have seen a cycle of worry and work as the deadline for my exhibition approaches. With little sleep, a cancelled social itinerary, and the end-of-month rush at my day job, I was spent. It was time to draw inspiration from the giants again. This time, I chose Hokusai. Many people do not know who Hokusai is and yet they are probably acquainted with his most famous work, Kanagawa-oki nami-ura, more commonly known as The Great Wave (see below). It's on mugs, fans, postcards, calendars, mousepads and desktop wallpapers. It may even be more famous than Munch's The Scream. Looking at Hokusai's prints, I am touched by their spirituality. They exhibit tremendous restraint and empathy for the human condition. Even though there is great attention to detail, the artist's ego is withdrawn. The Great Wave is a masterpiece because it encapsulates all these sentiments; above all, the fragility of human life in the face of awesome Nature. Nevertheless I was even more impressed by it when I saw its precursor, a print which Hokusai made more than ten years before The Great Wave. It is called Oshiokuri Hato Tsusen no Zu (Fast Cargo Boat Battling The Waves) (below). The differences between the two prints are very illuminating. The most obvious difference is that the ocean foam is drawn differently: in The Great Wave, they curl more and resemble claws to show a truly menacing wave. In Fast Cargo Boat the large wave is at the beginning of its descent back into the sea, but this shape is still too 'solid' to show the great force of the wave. In fact, it looks more like a mountain than a wave. 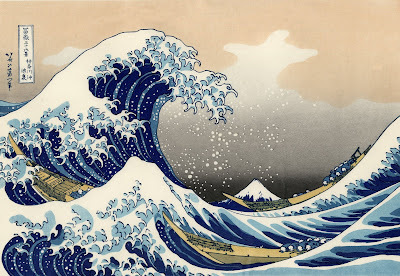 By contrast, in The Great Wave, Hokusai has let the wave curl forward more so that it is about to collapse onto the boats beneath, the terrifying wall of water spiralling to create a more dynamic form. Observe also the silhouette of the Great Wave and how this is echoed in the area that is taken up by the sky. Does it not remind you of the yin and yang symbol? I think this is intended to contrast the furious dramas of Life against the Eternal, here represented by the vast nothingness of the sky and Mount Fuji in the background. Speaking of Mount Fuji, The Great Wave is, of course, part of a series called The Thirty-Six Views Of Mount Fuji. To be honest, I did not even realize that this famous image had a mountain in it until today. 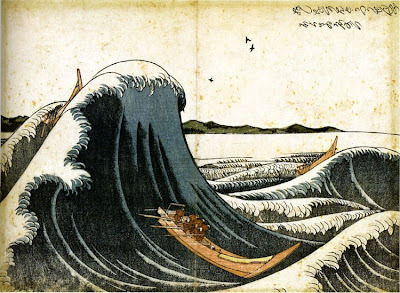 This just goes to show Hokusai's great restraint in relegating the sacred mountain to the background, even disguising it as one of the ocean waves! There is another detail that is terrifying when you think about it. Notice how in Fast Cargo Boat the mountains yonder still manage to peep through from behind the crest of the big wave? Look at the same area behind the crest in The Great Wave: there are no mountains here, only a tiny blue bit to show how high the sea has risen to engulf you! Compare also the horizon lines – Hokusai has lowered it in The Great Wave so that Mount Fuji is in line with the storm, taking us right into the centre of the action rather than a bird's eye view. Finally, it is interesting that there is a boat riding the crest of the wave in the earlier print. Hokusai eliminates this in The Great Wave. Other than interrupting the wave's dynamic curve, I suppose he felt it was verging on the triumphant? The human figures need to look overwhelmed, so they occupy only the lower half of the image in the final version. When I look at The Great Wave, I ask myself, what if I knew that every soul on those boats didn't survive? Or that they did? It would still be as affecting.